As the NASDAQ approaches historic highs, Apple’s market cap exceeds that of the Bovespa (the Brazilian equity index) and young social media companies like Snapchat have nosebleed valuations, there is talk of a tech bubble again. It is human nature to group or classify individuals or entities and assign common characteristics to the group and we tend to do the same, when investing. Specifically, we categorize stocks into sectors or groups and assume that many or most stocks in each group share commonalities. Thus, we assume that utility stocks have little growth and pay large dividends and commodity and cyclical stocks have volatile earnings largely because of macroeconomic factors. With “tech” stocks, the common characteristics that come to mind for many investors are high growth, high risk and low cash payout. While that would have been true for the typical tech stock in the 1980s, is it still true? More specifically, what does the typical tech company look like, how is it priced and is its pricing put it in a bubble? As I hope to argue in the section below, the answers depend upon which segment of the tech sector you look at. There are two things to note in this graph. 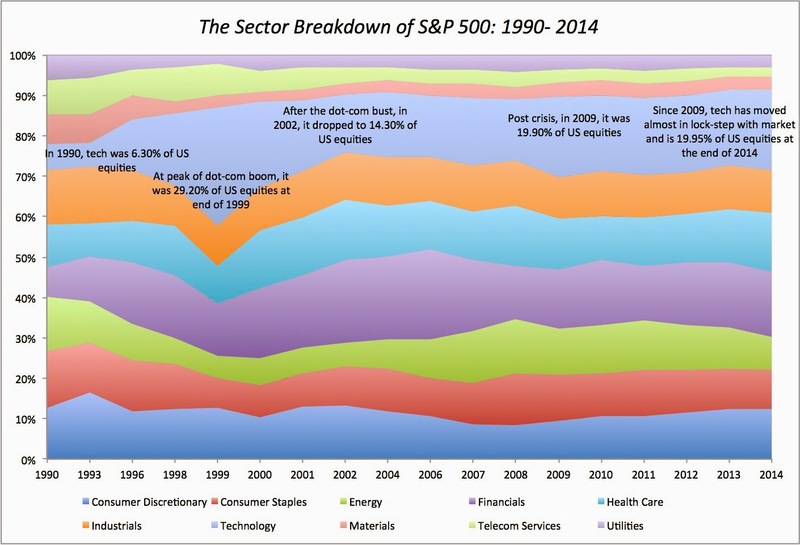 The first is that technology as a percentage of the market has remained stable since 2009, which calls into question the notion that technology stocks have powered the bull market of the last five years. The second is that technology is now the largest single slice of the equity market in the United States and close to the second largest in the global market. So what? Just as growth becomes more difficult for a company as it gets larger and becomes a larger part of the economy, technology collectively is running into a scaling problem, where its growth rate is converging on the growth rate for the economy. While this convergence is sometimes obscured by the focus on earnings per share growth, the growth rate in revenues at technology companies collectively has been moving towards the growth rate of the economy. Note that 341 technology companies have been in existence for more than 35 years and an additional 427 firms have been in existence between 25 and 35 years, and they collectively comprise about 41% of the firms that we had founding years available in the database. While being in existence more than 25 years may sound unexceptional, given that there are manufacturing and consumer product companies that have been around a century or longer, tech companies age in dog years, as the life cycles tend to be more intense and compressed. Put differently, IBM may not be as old as Coca Cola in calendar time but it is a corporate Methuselah, in tech years. The speedy rise of social media companies like Facebook, Twitter and Linkedin from nothing to large market cap companies, priced richly relative to revenues and earnings, has led some to the conclusion that this rich pricing must be across the entire sector. 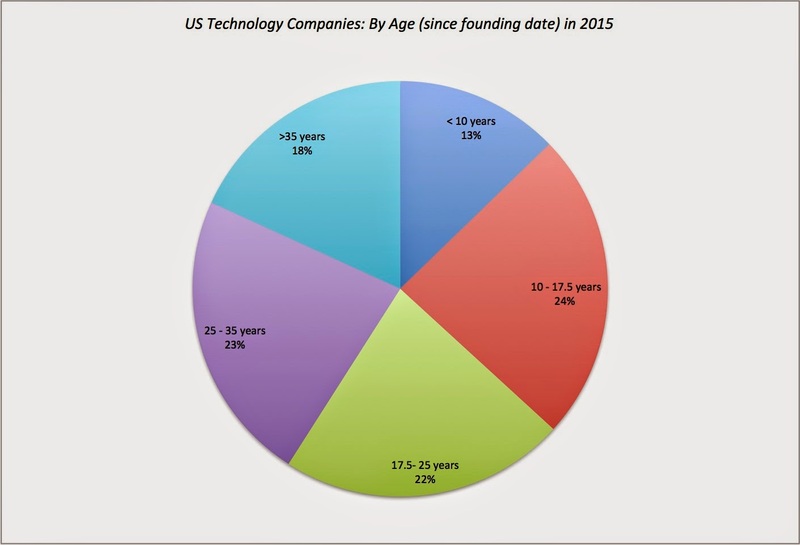 To see if this is true, I look at common pricing metrics across companies in the technology sector, broken down by age. To adjust for the fact that cash holdings at some companies are substantial, I computed a non-cash PE, by netting cash out of the market capitalization and the income from cash holdings from the net income. While it is true that the youngest tech companies look highly priced, the pricing becomes more reasonable, as you look across the age scale. For instance, while the youngest companies in the tech sector trade at 4.34 times revenues (based upon enterprise value), the oldest companies trade at 2.44 times revenues. Based on February 2015 Pricing & Trailing 12 month numbers: 2807 US technology and 6076 non-technology companies. The assessment depends upon what part of the technology sector you are focused on. While the youngest tech companies trade at much higher multiples of revenues, earnings and book value than the rest of the market, the oldest tech companies actually look under priced (rather than over priced) relative to both the rest of the market and to the oldest non-tech companies. In fact, even focusing just on the youngest companies, it is interesting that while young tech companies trade at higher multiples of earnings (EBITDA, for instance) than young non-tech companies, the difference is negligible if you add back R&D, an expense that accountants mis-categorize as an operating expense. Does this mean that you should be selling your young tech companies and buying old tech companies? I am not quite ready to make that leap yet, because the differences in these pricing multiples can be partially or fully explained by differences in fundamentals, i.e., young tech companies may be highly priced because they have high growth and old tech companies may trade at lower multiples because they have more risk and tech companies collectively may differ fundamentally from non-tech companies. There are three key fundamentals that determine value: the cash flows that you generate from your existing assets, the value generated by expected growth in these cash flows and the risk in these cash flows. Again, rather than look at tech stocks collectively, I will break them down by age and compare them to non-tech stocks. Young technology companies are far more likely to be losing money and have lower profit margins that young non-technology companies, even if you capitalize R&D expenses and restate both operating and net income (which I did). At the other end of the spectrum, old technology companies are much more profitable, both in terms of margins and accounting returns, than old non-technology companies, adding to their investment allure, since they are also priced cheaper than non-technology companies. The results are surprising and cut against the conventional wisdom, on most measures of growth. Young non-technology companies have grown both revenues and income faster than young technology companies, though analyst estimates of expected growth in earnings per share remains higher for young tech companies. With old tech companies, the contrast is jarring, with historic growth at anemic levels for technology companies but at much healthier levels for non-tech companies, perhaps explaining some of the lower pricing for the former. It is true, again, that the expected growth in earnings per share is higher at tech companies than non-tech companies, reflecting perhaps an optimistic bias on the part of analysts as well as more active share buyback programs at tech companies. I get a split verdict, with much higher volatility in stock prices in tech companies, young and old, than non-tech companies, accompanied by much lower financial leverage at tech companies, again across the board, than non-tech companies. As we noted in the earlier table, young tech companies are more likely to be losing money and that may explain why they borrow less, but I think that the high price volatility has less to do with fundamentals and more to do with the fact the investors in young tech companies are too busy playing the price and momentum game to even think about fundamentals. Note that both young tech and young non-tech companies have raised more new equity than they return in the form of dividends and buybacks, giving them a negative cash return yield. Old tech companies return more cash to stockholders both in dividends and collectively, with buybacks, than old non-tech companies. Finally, notwithstanding the attention paid to Apple's cash balance, old tech companies hold less cash than old non-tech companies do. In summary, here is what the numbers are saying. Young technology companies are less profitable, have higher growth, higher price risk and are priced more richly than the young non-tech companies. Old technology companies are more profitable, have less top line growth and are priced more reasonably than old non-tech companies. Truth in labeling: We are far too casual in our classifications of companies as being in technology. In my book, Tesla is an automobile company, Uber is a car service (or transportation) company and The Lending Club is a financial services company, and none of them should be categorized as technology companies. The fact that these firms use technology innovatively or to their advantage cannot be used as justification for treating them as technology companies, since technology is now part and parcel of even the most mundane businesses. Both companies and investors are complicit in this loose labeling, companies because they like the “technology” label, since it seems to release them from the obligation of explaining how much they need to invest to scale up, and investors, because it allows them to pay multiples of revenues or earnings that would be difficult (if not impossible) to justify in the actual businesses that these firms are in. Age classes: We should start classifying technology companies by age, perhaps in four groups: baby tech (start up), young tech (product/service generating revenues but not profits), middle-aged tech (profits generated on significant revenues) and old tech (low top line growth, though sometimes accompanied by high profitability), without any negative connotations to any of these groupings. If we want to point to mispricing, we should be specific about which group the mispricing is occurring. In this market, for instance, if there is a finger to be pointed towards a group, it is not technology collectively that looks like it is richly priced, but baby and young technology companies. By the same token, if you follow rigid value investing advice, where you are told to stay away from technology on the grounds that it is high growth, high risk and highly priced, that may have been solid advice in 1985 but you will be missing your best “value” opportunities, if you follow it now. Youth or Sector: When we think of start-ups and young firms, we tend to assume that they are technology-based and that presumption, for the most part, is backed up by the numbers. However, there are start-ups in other businesses as well, and it is worth examining when mispricing occurs, whether it is sector or age-driven. It is true that young social media companies have gone public to rapturous responses over the last few years but Shake Shack, which is definitely not a technology company (unless you can have a virtual burger and an online shake) also saw its stock price double on its offering day and biotechnology companies had their moment in the limelight in 2014, as well. Life Cycle dynamics: I have talked about the corporate life cycles in prior posts and as I have noted in this one, there is evidence that the life cycle for a technology company may be both shorter and more intense than the life cycle for a non-technology company. That has implications for how we value and price these companies. In valuation, we may have to revisit the assumptions we make about long lives (perpetual) and positive growth that we routinely attach in discounted cash flow models to arrive at terminal value, when valuing technology companies, and perhaps replace them with finite period, negative growth terminal value models for fading technologies. In pricing, we should expect to see a much quicker drop off in the multiples of earnings that we are willing to pay, as tech companies age, relative to non-tech companies. I will save that for a future post. I am under no illusions that this post will change the conversation about technology companies, but it will give me an escape hatch the next time I am asked about whether there is a technology bubble. If nothing else, I can point the questioner to this post and save myself the trouble of saying the same thing over and over again. A few months ago, I suggested that investors venture where it is darkest, the nether regions of the corporate world where country risk, commodity risk and company risk all collide to create investing quicksand. I still own the two companies that I highlighted in that post, Vale and Lukoil, and have no regrets, even though I have lost money on both. At the time of the post, I was asked why I had not picked Brazil’s other commodity colossus, Petrobras, as my company to value (and invest in) and I dodged the question. The news from the last few days provides a partial answer, but I think that the Petrobras experience, painful though it might have been for some investors, provides an illustration of the costs and benefits of political patronage. In the last decade, Petrobras has seen both highs and lows, becoming the fifth largest company in the world, in terms of market capitalization, in 2011 and then seeing a precipitous drop off in market prices in the years since. To understand where Petrobras is now and to make sense of where it is going, you have to look at both its rise in the last decade and its fall in this one. The rise of Petrobras from minor emerging market oil company to global giant between 2002 and 2010 can be traced to three factors. The first was the discovery of major new reserves in Brazil in the early part of the last decade, which catapulted the company towards the top of the list of companies with proven reserves. The fact that these reserves would be expensive to develop was mitigated by a second development, which was the sustained surge in oil prices to triple digit levels for much of the period, making them viable. The third was an overall reduction in Brazilian country risk from the stratospheric levels of 2001 (when the country default spread for Brazil reached 14.34%, just before the election of Lula Da Silva as President) to 1.43% in 2010, when Brazil looked like it had made the leap to almost-developed market status. In 2010, the company signaled that its arrival in global markets and its ambitions to be even more by raising $72.8 billion from equity markets. The hubris that led to the public offering may have been the trigger for the subsequent fall of the company, which has been dizzying because of the magnitude of the decline, and its speed. After peaking at a market capitalization close to $244 billion in 2010, the company has managed to lose a little bit more than $200 billion in value since, putting it in rarefied company with other champion value destroyers over time. While a large portion of the blame for the decline in the last few months (especially since September 2014) can be attributed to the drop in oil prices, note that Petrobras has already managed to destroy $160 billion in value prior to that point in time. To understand the Petrobras story, you have to start with an assessment how the company is structured. When the government privatized the company, it did so with the objective of raising capital for its treasury but it did not want to release control of the company to the shareholders who bought shares in the company. Using "national interest" as a shield, the government devised a game where it would be able to control the company, while raising billions in capital from investors. The basis for that game, and it is not unique to Petrobras, was to create two classes of shares, one with voting rights (common shares) and one without (called preferred shares, in an Orwellian twist), and offering the latter primarily to investors. The government retains control of more than 50% of the voting shares in the company and another 11% is controlled by entities (like the Brazilian Development Bank, BNDES, and Brazil's sovereign wealth fund) over which the government has effective control. Not quite satisfied with this rigging of the game, the government also retains veto power (a golden share) over major decisions. Using this control structure, the government has created the ultimate rubber stamp board, whose only role has been to protect the government's interests (or more precisely the politicians who comprise the government at the time) at all costs. Brazilian company law does require that the minority shareholders (anybody but the government) have board representatives, but as this story makes clear, these directors are not just ignored but face retaliation for raising basic questions about governance. To be fair to Ms. Dilma Rousseff, government interference has always been the case in Petrobras, and her predecessors have been just as guilty of treating Petrobras as a piggybank and political patronage machine, as she has. Lula, who stepped down with great fanfare, as president just a few years ago was equally interventionist, but high oil prices provided the buffer that protected him from the fallout. Just as looking at companies that have created significant amounts of value over time is enlightening because of the insights you get into what companies do right, Petrobras should become a case study for the opposite reason. 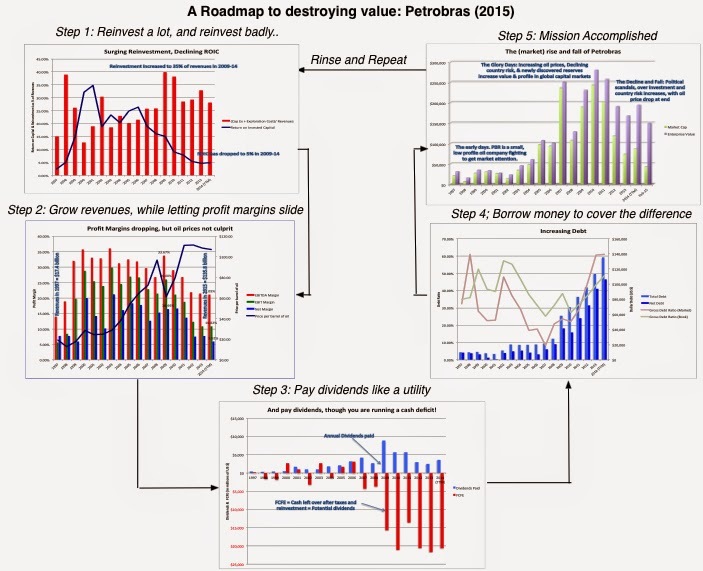 Put in brutally direct terms, if you were given a valuable business and given the perverse objective of destroying it completely and quickly, you should replicate what Petrobras has done in five steps. Invest massive amounts of money in new investments, with little heed to returns on these investments, and often with the intent of delivering political payoffs or worse. Between 2009 and 2014, Petrobras stepped up its capital expenditures and exploration costs to more than 35% of revenues, well above the 15-20% invested by other integrated oil companies, while seeing its return on capital drop to 5% (even as oil prices stayed at $100+/barrel for the bulk of the period). Petrobras has grown its revenues from $17.4 billion in 1997 to $135.8 billion in 2014 and displaced Exxon Mobil as the largest global oil producer in the third quarter of 2014, while letting profit margins drop dramatically. The government contributes to this dysfunctional growth by putting pressure on the company to sell gasoline at subsidized prices to Brazilian car owners. Petrobras has a history of paying large dividends, partly because it had the cash flows to pay those dividends in the 1990s and partly to supports it voting share structure. The preferred (non-voting) shares that the company has used to raise capital, without giving up control, come with dividend payout requirements that are onerous, if you have growth ambitions. If you want to eat your cake (by investing large amounts to generate growth) and have it too (while paying large dividends), the only way to make up the deficit is to raise fresh capital. In 2010, Petrobras did raise $79 billion in fresh equity but it has been dependent upon debt as its primarily financing in every other year. As a consequence, Petrobras had total debt outstanding of $135 billion at the end of 2014, more than any other oil company in the world. If you over invest and grow without heeding profitability, while paying dividends you cannot afford to pay and borrowing much more than you should be, you have created the perfect storm for value destruction. In fact, the way Petrobras has been run so defies common sense and first principles in corporate finance, that if I were a conspiracy theorist, I would be almost ready to buy into the notion that this is part of a diabolical plan to destroy the company hatched by evil geniuses somewhere. I have learned through hard experience, though, that you should not attribute to malevolence what can be explained by greed, self-dealing and bad incentive systems. It is worth noting that none of the numbers in the last section can be attributed to the drop in oil prices. 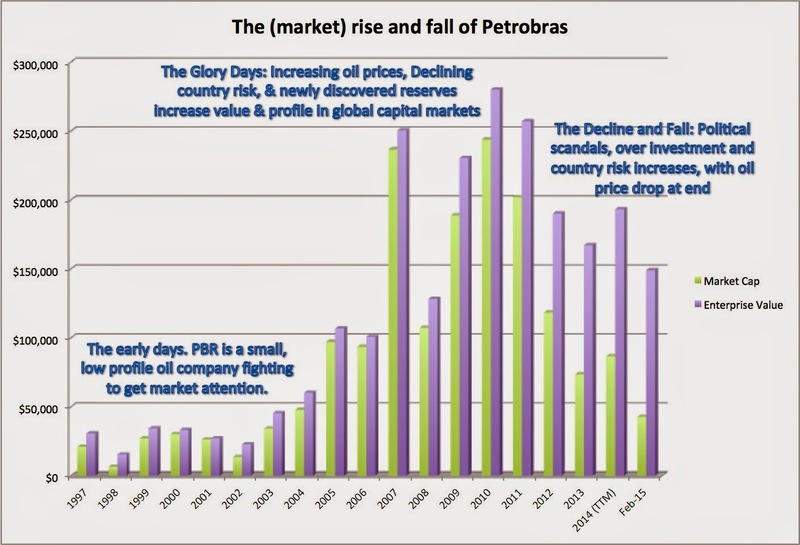 In the most recent twelve month data that you see in these graphs represent the year ending September 30, 2014, and the average oil price during that year exceeded $100/barrel.The government of Brazil, working through the management that they installed at Petrobras, have pulled off the amazing feat of destroying more than $200 billion in value with no help from outside. When a company falls as fast and as far as Petrobras has, it attracts the interests of contrarian investors and the company looks attractive on the surface, at least using some conventional multiples. 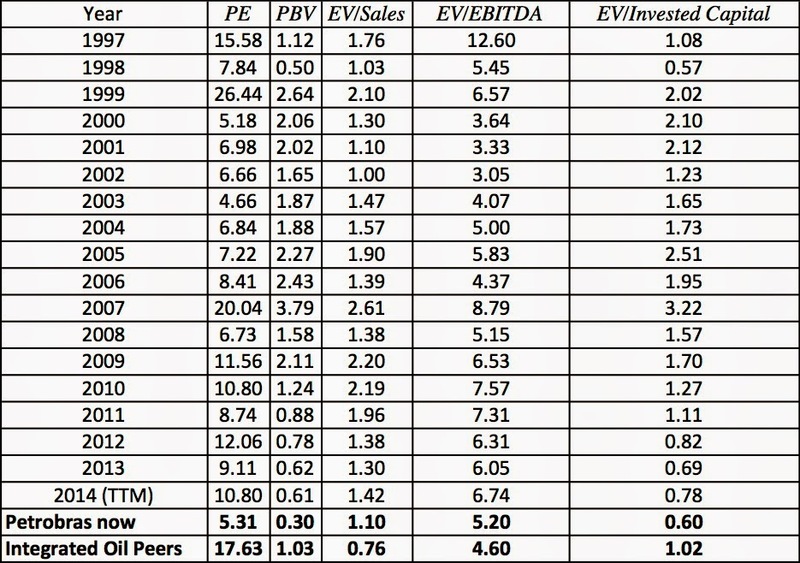 Petrobras looks very cheap, at least using equity multiples (PE and Price/Book) but the results are mixed with enterprise value multiples. Thus, if you assume that the current oil price of $51.69 is close to the average for this year, the normalized revenues for Petrobras will be $61.3 billion, a drop off of about 55% from the $135.8 billion revenues in the 12 months ending September 30, 2014. The red numbers represent the dead zone, where the value of the business is less than the debt outstanding and they dominate the table. In spite of the reckless abandon shown by its management, there remain some bright spots, if you are an optimist. The first is that the company is one of the largest oil producers in the world and if oil prices rebound, they will see a jump in revenues. The second is that the exploration and investments over the last decade have given the company the fifth largest proven oil reserves in the world, though the proportion of these reserves that will be viable at today's oil prices is open to question. The third is that if the Brazilian government stops pulling the strings and management stops its self destructive behavior, profit margins and returns will improve. In the most optimistic spin, you can assume that Petrobras will be able to keep its trailing 12-month intact at $135.8 billion, improve its operating margin to the 21.1% that it earned in 2010 and its return on capital to 13.36% (10-year average), while reducing its debt ratio to 43.5% (average over last 5 years). With those assumptions, which border on fantasy, Petrobras would be worth $8.11/share (R$ 22.55/share) well above the current stock price of $3.28/share (R$ 9.12/share). You are welcome to try out different combinations of your assumptions in this spreadsheet and see what you get. Hire a chief operating officer who knows the oil business and turn over operating responsibilities to him. Fire anyone in the top management who has any political connections. That may leave lots of empty offices in Petrobras headquarters, but less damage will be done by no one being in those offices than the current occupants. Side with directors for the minority stockholders and push for a more independent, accountable board. Refuse to go along with the cap on gasoline prices for Brazilian consumers, a subsidy that has already cost the company $20-$25 billion between 2011 and 2013. With oil prices low, the consumer backlash will be bearable. Push openly for a move to one class of shares with equal voting rights. Accompany this action by cutting dividends to zero. Clean up the investment process with less auto-pilot exploration, production that is in line with oil prices and less focus on growth, for the sake of growth. There are always lessons to be learned from every calamity and Petrobras qualifies as a calamity. The first is to recognize that there every reason to be skeptical when politicians claim "national interest" and meddle incessantly in public corporations. In most cases, what you have are political interests which may or may not coincide with national interests, where elected politicians and government officials use stockholder money to advance their standing. The second is that those who have labeled "value maximization" as the "dumbest idea" and pushed for stakeholder wealth maximization, a meaningless and misguided objective that only strategists and Davos organizers find attractive, as an alternative, should take a close look at Petrobras as a case study of stakeholder wealth maximization gone amok. In the last five years, Petrobras has enriched countless politicians and politically connected businesses, subsidized Brazilian car owners and provided jobs to tens of thousands of oil workers, leaving stockholders on the outside looking in. Anyone who argues that this is a net good for Brazil has clearly not grasped the damage that has been done to the country in the global market place by this fiasco. Corruption update: I have been asked by many of you as to why have sidestepped the corruption stories that have been swirling around the company. I did so, not because I want to avoid controversy (which I don't mind at all) but because I thought that at least in this case, being subtle delivers the message about political game playing better than brute force. At Petrobras, I treat corruption as a really bad investment with horrible returns to stockholders, but I believe that with its management structure, the company was destined for trouble, and that the corruption just greased the skids. My kids are inclined to binge TV-watching, especially in the winter, and this Christmas break, when they were all home, they were at it again. Having gone through all the Walking Dead episodes during the summer and Criminal Minds multiple times, they chose Shark Tank as the show to watch in marathon format. For those of you who have never watched an episode, it involves entrepreneurs (current or wannabe) pitching business ideas to five 'sharks', who then compete (if interested) in offering capital (cash) for a share of the business. Like some large families, we make even TV watching a competitive sport, especially when there are multiple shark offers on the table, with family members ranking the offers from best to worst. In one episode, a contestant was faced with two offers: the first shark offered $25,000 for 20% of the business and the second one jumped in with $100,000 for 50% of the business. While one family member suggested that the second offer was obviously better and everyone else in my family concurred, I was tempted to argue that it was not that obvious, but wisely chose to say nothing. A late night family gathering is almost never a good teaching moment, especially when your own children are in the audience. Thus, the two offers effectively attach the same value to the business and at least on this dimension, the entrepreneur should find them equivalent. While the VC definition is technically right, it is sterile, because if you have a pre-money value for a business, you can always extract the post-money value, or vice versa, but both estimates are only as good as your initial value estimate. It is also opaque, because the process by which value is estimated is often unspecified and and made more so when the simple exchange of capital for a share of ownership is complicated by add ons, with options to acquire more of the business, first claims on cash flows and voting rights thrown into the mix. While some of the opacity that accompanies pre-money and post-money valuations is related to the fact that you are dealing with young, start-ups, often without operating histories or clear business models, I believe that some of it is by design. By leaving the discussion of value vague and/or making the exchange of capital for proportion of the business complicated, venture capitalists can create enough noise around the process to confuse entrepreneurs about the values of their businesses. By the same token, the sloppiness that accompanies much of the discussion of pre-money and post-money valuations in venture capital can also lead to excesses during periods of exuberance, where the fact that too much is being paid for a share of a business is obscured by the confusion in the process. 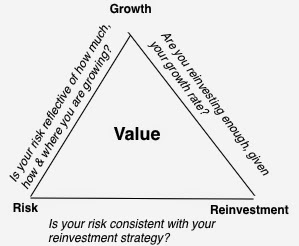 I know that intrinsic valuations (and DCF valuations, a subset) are considered to be unworkable by many in the venture capital community, with the argument given that the young, start-ups that VCs have to value do not lend themselves easily to forecasting cash flows and/or adjusting for risk. I disagree but I think that even if you are of that point of view, the path to understanding pre-money and post-money values is through the intrinsic valuation of a very simple business. Note that the $100 million value attributed to you (as the equity investor) in the intrinsic value balance sheet is based on a notional toll road, not one in existence. Now, let's assume that you don't have the capital on hand to build the road and approach me (a venture capitalist) for $100 million in capital that you plan to use to build the road. Assuming you convince me of the viability of the business and that I invest $100 million with you, here is what the balance sheet will look like the instant after I invest. Note that the business value has doubled to $200 million, with half of the value coming from the cash infusion. That cash is transitory and will be used by you to invest in the toll road, and the minute that investment is made, the balance sheet will reflect it. While the value of the business has not changed from the post-cash number, the nature of its assets has, with a physical toll road now setting value, rather than a license and cash. Thus, the value of the business after the cash infusion is $200 million and this is the post-money valuation of the company. Case 1 - Only entrepreneur in market, Lots of capital providers: Assume that you are the only entrepreneur with a valuable franchise in the economy and there is a large supply of capital (from banks, venture capitalists, private equity investors). You (as the entrepreneur) have all the power in this negotiation and I will end up with a 50% share of the post-money valuation ($200 million). Case 2 - Lots of entrepreneurs with valuable franchises, a monopolist capital provider: At the other extreme, if I (the VC) am the only game in town for capital, I will argue that without me your franchise is worth nothing, and that I should end up with all of the value (thus giving me close to 100% of the business). The reality will fall somewhere in the middle. In general, the value that you will use to compute your percentage ownership will be neither the pre-money, nor the post-money value. It will be the value of the business, with the next best capital provider providing the $100 million in capital. In the toll road example, assume that you can borrow $100 million from a bank at 7.5%, a rate that is much too high, given the risk of the investment (zero). The value of your equity in this toll road will now have to reflect the interest payments on this debt. Note that the bank has effectively claimed $50 million of the value of the business by charging you too high a rate and netting out the bank's surplus yields a value of $150 million for the toll road, the "ownership value", since the ownership stake will be based on it. As the venture capitalist, I recognize that this is your next best option and demand two-thirds of your business for my $100 million. In summary, then the ownership percentage of your business that I will get in return for my capital provision can range from 50% to close to 100%, depending on the relative supply of entrepreneurs and venture capital in a market. 1. 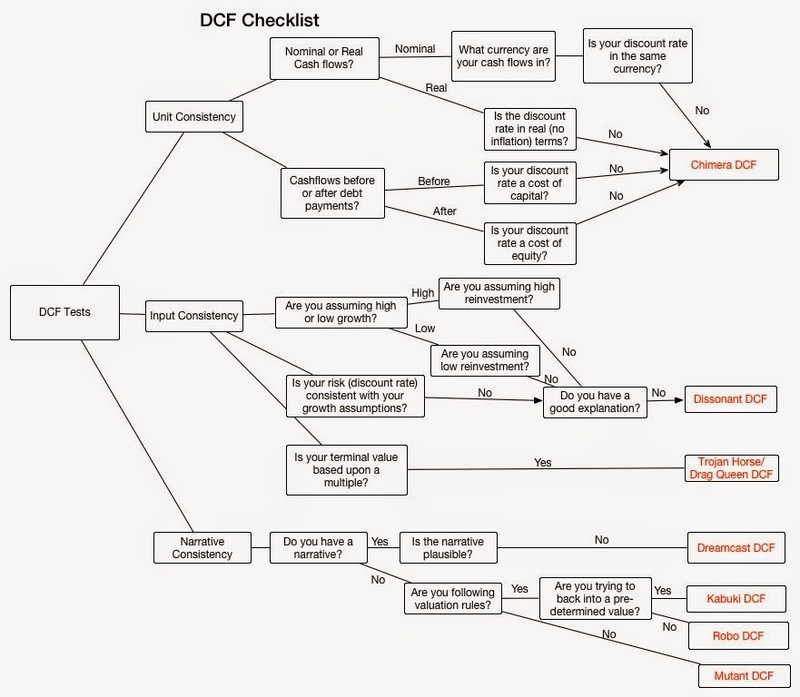 A DCF valuation, done right, always yields a pre-money value for a business. 2. The value of a business, after a capital infusion, will have to incorporate the cash that comes into the business, pushing up the post-money value. 3. The "ownership value on which the ownership proportion is negotiated will move towards the post-money value, when there is an active and competitive (venture) capital market, and towards the pre-money value, when there is not one. The Pricing World: Pre-money or Post-money? When you price companies, the question of whether the value you arrive at today is a pre-money or post-money valuation becomes murkier. The forecasted revenues that you forecast in year 3 is not (and often are) only based on the assumption that there is a capital infusion in the firm today but that there may be more capital infusions in the future, in which case it is a post-post-post money valuation and adding cash to this value will be double counting. (As an analogy, consider the toll road example that I used in the intrinsic value section. The earnings on the toll road are expected to be $10 million a year and the toll road should trade at about twenty times earnings, given its fundamentals. Using the VC approach, the value that I would get is $200 million, which is the post-money valuation). Can you modify the VC approach to deliver a pre-money pricing? Yes, and here is what you would have to do. You would have to forecast two measures of future earnings, one with the capital infusion and one without. In the extreme scenario where the start-up will cease to exist without the capital and there are no other capital providers, the expected earnings in year 3 will be zero, yielding a pre-money valuation of zero for the company. Consequently, you will demand all or almost all of the company in return for your investment. Pricing is opaque: While pricing is market-based, quick and convenient, the cost of pricing an asset rather than valuing it is that the process glosses over details and makes it difficult to figure out what exactly you are getting for your investment today and what you have already incorporated in that number. The Target rate is Swiss Army knife of VC valuation; In the VC approach, the target rate (though called a discount rate) is like a Swiss Army knife, serving multiple purposes. First, it is a reflection of the expected return you should make, given the risk in the investment, i.e., the conventional risk-adjusted rate. Second, it incorporates the survival risk in the company, i.e., the reality that many of the companies that VCs invest in don't make it and that you have to lower the value of start-ups to reflect this risk. Third, it includes a component to cover the future capital needs of the business, with a higher discount rate being used for companies that will need more rounds of capital. Finally, it is a negotiating tool, with VCs pushing up the target rate, if they feel that they have a strong bargaining position. While it is impressive that so much can be piled into one number, it does make it difficult to figure whether you have counted all of these variables correctly and not double counted or miscounted it. It also implies that the actual returns generated by VCs will bear little resemblance to the target returns; the table below summarizes venture capital returns across VC funds over the last year, three years, five years and ten years and compares them to returns on growth equity mutual funds and the S&P 500. Winners and Losers: It is not clear who wins and loses in the pricing game, when sloppiness rules. In periods where entrepreneurial investments are plentiful and venture capital funding is scarce, it probably leads to venture capitalists claiming too large a stake in the businesses that they invest in, given the capital invested. During periods when entrepreneurial investments are scare and venture capitalists are plentiful, my guess it that it leads venture capitalists to overpay for businesses. I am not making an argument that venture capitalists and other early stage investors shift to intrinsic valuation. While I believe that they under use and often misunderstand intrinsic valuation, I think that the attachment to pricing is too deep for them to shift. I do believe though that everyone (founders, entrepreneurs, venture capitalists) would be better served if there was more transparency in the process and we were more explicit about the basis for assessing ownership rights (and proportions). Perhaps, I will start by making myself unpopular in my household and bringing up the discussion of pre and post money valuations during Shark Tank!